Place the Winco PUT-12B Polycarbonate Utility Tong, Beige 12" in various crocks at your salad bar so guests can serve themselves with ease. These polycarbonate tongs from Winco are available in various colors so you can help prevent cross-contamination by assigning different colored tongs to different food types and help maintain HACCP standards. 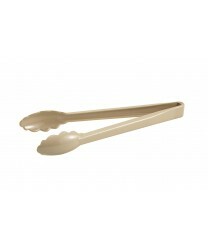 Made of durable polycarbonate, these sturdy tongs are dishwasher safe and easy to handle.